French country style furniture, unlike its Parisian counterpart, reflects the practical provincial lifestyle. Traditionally, outside of the major cities, French furniture was used for a purpose, not merely as decoration. Furniture was made of the elements and woods at hand, such as pine and stone, with little adornment. Modern French country furniture pays tribute to these roots in its simple lines, limited adornments, and natural-colored stains and paint. Pierre Deux: Pierre Deux is a leader in French country home decor. They offer an extensive collection of furniture for every room in the home, from kitchens to bedrooms. New furniture items are introduced seasonally. Keep an eye out for sale merchandise and free shipping promotions. French Country Furniture Direct: This company uses salvaged wood in their French country furniture, lending each piece an authentic look. They make their furniture by hand in small batches, so no two items are exactly alike. You won't find much in the way of upholstered furniture here, but this shop is a great destination for your wood pieces. Country Cottage Collections: Country Cottage Collections doesn't sell French country furniture exclusively, but their French Laundry Home collection features beautifully upholstered headboards, sofas and chairs, plus painted wood pieces. If you're not sure how a particular fabric or wood color will look in your home, order a free sample. Kate Madison: For handmade quality and custom design, turn to Kate Madison. This small company has a big selection of furniture, and most pieces can be painted or stained to your specifications. A team of 19 carpenters builds every piece. You can opt to select one of the company's many standard designs, or instead, work with a designer to come up with your own unique piece of furniture. For furniture on a budget, don't forget to check retailers like Home Goods and Target, where you can often find French inspired pieces for a fraction of the cost. The centerpiece of any French country kitchen is the table. Originally made to accommodate the farm workers who would dine together in the farmhouse's kitchen, a traditional French country-style dining table seats from six to twelve persons. French country tables are generally of simple design, usually a thick wooden (made often made of pine) plank atop straight legs or unadorned platforms. Chairs are usually made of wood with caned seats, sometimes topped with cushions made of colorful Provencal prints. Benches may also be used to accompany the table. Other kitchen furniture might include a carved wooden cabinet for china, linens, and silverware. (Remember, French farmhouses generally did not have any cabinets or closets.) A wheeled, wooden cart might also be added, useful for bringing food to the table or to act as a sideboard. French country bedroom furniture, again, relies on the basics. A sturdy four-poster bed is required, as is a large (usually pine) armorire to be used as a closet. Small bedside tables can also be added. In modern houses (with lots of closet space), the armorire can function as a TV/entertainment center or even a small, fold-away computer station. Another interesting use for a French country armoire is in a hall outside the bedrooms and bath, filled with plush, colorful towels and linens. French country-style uses upholstered pieces sparingly. Often the chairs, settees, and sofas have carved wooden frames and legs with colorful upholstered seats, arms, and backs. Upholstery fabrics and colors reflect the sun, sea, and fields of flowers found in the south of France. Lavender, goldenrod, deep rust, and azure blue are commonly used. Subtle design details add interest to French country furniture. Commonly-used elements are wrought-iron door and drawer hardware, curved chairbacks and cabinet lines, and carved raised motifs, depicting such things as wheat, flowers, and fruit -- the bounty of the countryside. 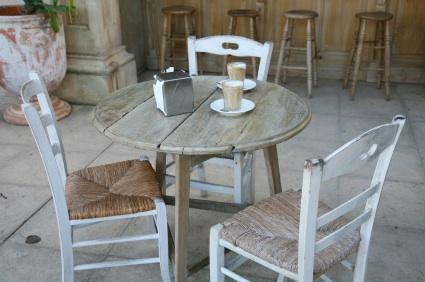 Most country French style furniture is stained a natural color, such as honey brown or light natural pine. Some painted pieces, particularly in light green hues and white are also frequently found. French country furniture is classic and timeless, so quality pieces can stay in your home for many years. Get more ideas about completing your French Country home with LoveToKnow's look at French Country Style Basics.